This year’s PAX East in Boston, MA, was very different in tone than in previous years. The abdication of Twitch left a vacuum for streaming services that was more than capably filled by Mixer and Facebook Gaming with large booths and partners doing meet and greets and broadcasting live on the show floor. In the triple-A gaming space, many recurring favorites were missing. Blizzard didn’t even send a merch booth like last year, although UbiSoft brought one. Intrepid Studios’ Ashes of Creation, which had a large booth and did a panel last year, was noticeably absent this year. It’s kind of understandable that ArenaNet wouldn’t have a presence despite Guild Wars 2 releasing a new big content update recently. Electronic Arts also didn’t do a booth this year. Two more social aspects of the convention were also different: fewer (and lesser known) musical acts booked to perform, and no real huge parties like even just two years ago. In the MMO space, one of the two biggest splashes was Square Enix promoting their Final Fantasy XIV expansion Shadowbringers with a raid boss demo, an aetheryte crystal prop in the lobby, large wraps across the skywalk between the BCEC and Westin hotels, and several other non-MMO games in a large booth. The other was Bethesda, which took over the MJ O’Connors restaurant and comedy club Laugh Boston next door in the Westin to promote their suite of games, including the new Elder Scrolls Online expansion, Elsweyr. There were some fairly big announcements this year, but it seems the largest one was Gearbox announcing Borderlands 3 out of the blue. This time around, the selection of panels was less about game companies talking up their games, although there were folks like Obsidian revealing more details about their latest entry, The Outer World. Most of the panels were from industry people speaking more about the industry itself, whether it focused on getting into the industry, how to handle streaming partnerships, the history of gaming, activists promoting healthier behaviors within gaming, or various social aspects of gaming with medical professionals. Remember, in years past (2013, to be precise), Blizzard did the global reveal of Hearthstone at PAX East, so there’s certainly been a culture shift within PAX itself. Esports took an unsurprisingly more prominent role than in years past, with a whole arena set aside for various games, including the Magic: the Gathering Mythic Invitational tournament with a $1M prize pool. However, all of this is not to say there weren’t MMOs on the show floor, or even MMO-adjacent games. It was just a lot harder to find most of them, since the usual big guns in that gaming space weren’t present. Even some of the smaller studios skipped this year, such as Visionary Realms’ Pantheon, Frontier’s Elite: Dangerous, Funcom’s Conan Exiles, and Soulbound Studios’ Chronicles of Elyria. The indie scene at this year’s PAX was huge. In previous years, if one divided up the show floor into four equal portions, it would be half triple-A and big MMOs, a quarter indies, and a quarter tabletop (including tables to play upon!). This year, it was shifted so that indies had half the space. Some of the so-called indie titles weren’t just tiny spaces in the Indie Megabooth, but sprawling booths such as the one for Phoenix Labs’ Dauntless. The triple-A versus indie labels are still present because it depends on whether there’s huge corporate oversight or money backing a project, such as EA having a plethora of studios under its wing. 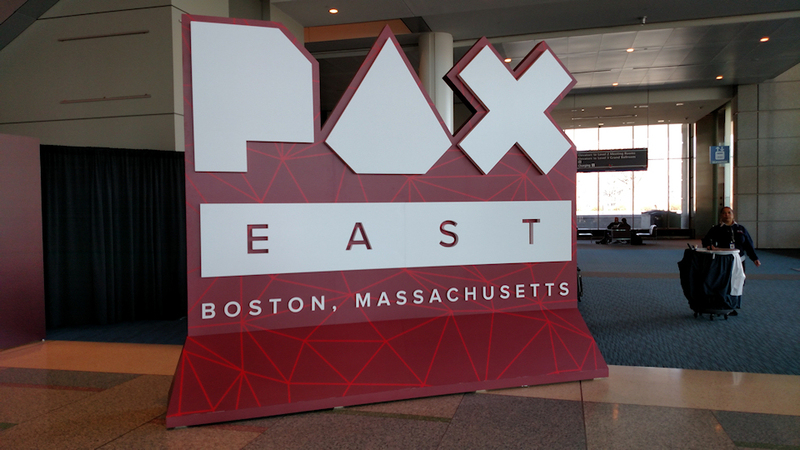 Overall, PAX East 2019 was less about MMOs (even MMO-adjacent games) and more about a balanced industry of games of all kinds. The convention itself wasn’t noticeably larger or smaller than in previous years beyond this being the second year of having it be a four-day affair, and it’s still difficult to make enough time to meet with all of one’s friends and acquaintances. In all, it might be seen as a decline in MMOs in general, or at least games that are shying away from the label MMO. It might also have to do with rising costs, because PAX booths aren’t cheap. There was also a distinct shift away from previous industry behemoths, but also a rise of more booths there simply to sell merchandise rather than to promote a game. Whether this trend is unique to PAX East will be determined when PAX West comes up later this year, and we can see how it is there. We’ll be bringing you several articles from PAX East over the next few days, so keep an eye out for them as well. If you were at PAX East 2019, feel free to share your thoughts in the comments below.